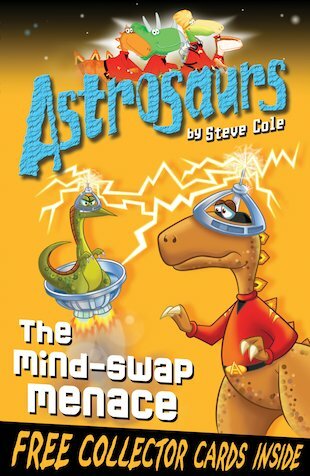 The Astrosaurs are on another mission when they almost crash into a deserted space station. But what is inside the ruin? When our plucky heroes investigate, they realise it is a dinosaur prison that has been hit by a meteor and abandoned. Then Teggs and Iggy are taken captive by two dastardly prisoners who are hiding out in the wreckage! The master criminals have a body-swap machine – and they plan to use it on the captive Astrosaurs! Can Gipsy and Arx save their Captain before it’s too late? This book is soooooooooooo exciting, I have now got the whole set! I went and got the new book today, The Robot Raiders. I can’t wait to read it!